48 pages, FULL COLOR, no ads! Celebrating 20 years of BEN DUNN'S trend-setting and acclaimed Ninja High School! 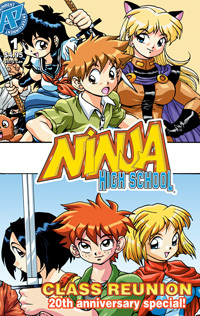 Take a unique tour through the history of Ninja High School, one of the longest continuously running independent comics and American manga in existence, spanning 20 years, over 150 issues, specials, and more! This celebratory special features commentary on every regular issue from both Ben Dunn and Robby Bevard, plus contributions from such illustrious NHS alumni as Fred Perry, Rod Espinosa, and Joe Wight! Send in your RSVP now for this retrospective tribute to a truly groundbreaking series that introduced countless readers to the concept of American Manga and captivated fans the world over!